Author Georgia L. Jones is on tour – check and see where she will be! 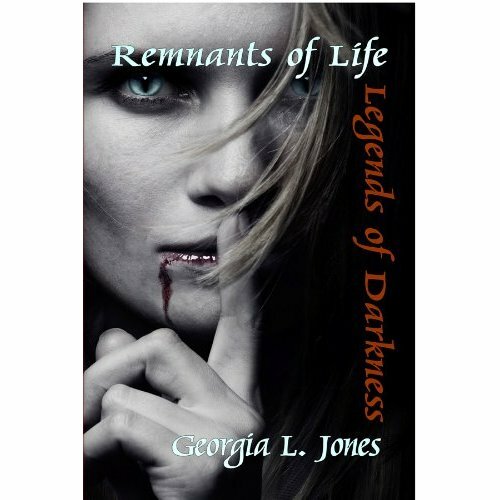 Author Georgia L. Jones has met delightful reactions to her debut series, Remnants of Life. The first book in the series, Legends of Darkness, introduces the reader to Samoda, who had just recently been reborn – literally. Join Samoda as she learns about her new life: the allies and the enemies, not to mention the forces that lie just beyond the veil. Published by BlackWyrm, this series has promise. Go to a convention, find Georgia L. Jones at the BlackWyrm booth, check out her book, and join in the fun! In addition, be on the lookout for her second book, Witches, due to be released soon. Rumor has it art legend Larry Elmore contributed to the cover art. That promises to be a delight in and of itself! Artist James R. Powell’s stunning work shown on Phobophobia cover art! Ever sat in a crowded place, bored or distracted, until someone walks by with something that just draws your attention – whether you meant it to or not? Think of that reaction as a reader walks by with the eye-catching artwork of James R. Powell featuring the title “Phobophobia”. Moreover, the cover is aptly made to draw a new reader into tales of fear. There is nothing to fear but fear itself…Twenty six original tales of horror by established masters of terror and talented new voices lie within this Lexicon of Fear.Beware the dark power of words in BIBLIOPHOBIA…a carnival double act made in Hell can be found in the clown cemetery in COULROPHOBIA…an artist loses his power to create ice sculptures because of his fear of cold in FRIGOPHOBIA, but that is the least of his problems as his therapist suffers the same phobia…The fear of open spaces manifests itself in KENOPHOBIA, a tale of the ultimate emptiness – the Great Void that awaits us all…the fear of beautiful women is fully justified in VENUSTROPHOBIA, a tale of futile defence against the Succubus……but beware: the cure may be worse…Denying yourself a place in Heaven is one way to avoid JESUSPHOBIA, but the only alternative means Hell to pay…a playwright fights his fear of the colour yellow by creating an unusual addition to his Dramatis Personae in XANTHOPHOBIA…a Witchfinder’s fear of open water will only be relieved by imbibing one of two deathly fluids in AQUAPHOBIA…and a widower follows the age-old advice of turning to face your fear in QIQIRN, only to uncover the true nature of an Inuit dog spirit that carries the essence of cold terror from its ancient homeland into the realm of human grief…Open the pages. It is time to learn your A to Dread.. While some stories are better than others, there is a little bit of each of them in the artwork presented by James R. Powell. Kudos to him for doing such a delightful job! Look for a new rendition from him in a September 1, 2012 novella release to be known as “Dead Education’s Army Book One: Flesh Code” by Alan Dale. Hey everyone in the Atlanta area and NOTP. Tammy Pryce and I will be showing our art at this great shop called “Forever and a Day” It’s on 92 north of 575. Please come support us and this wonderful store, by coming out on Saturday September 15th. We are so excited to announce the Gallery event we are hosting at Forever And A Day on September 15th with the art of Lindsay Archer and Tammy Pryce being highlighted. More images to follow. These two girls have wonderful pieces of art. Lindsay Archer has been working with art since she could pick up a pencil. Through hardships and victories, Archer’s renditions have been both inspiring and captivating to any who have seen them. Recently partnering with fellow artist Tammy Pryce, the duo have been delighted at the results of their collaboration. For the first time, they will be sharing them with the public on September 15, 2012 at a little shop called Forever And A Day, and they want you to be there! To see their collaborative works, either find them on Facebook or, better yet, visit Forever And A Day on September 15, 2012 and get one of your very own! 2013 Young Voice Writer’s Competition begins September 1, 2012! “Know any young writers in seventh grade through high school? The New Voices Young Writer’s Competition™ encourages reading and writing among middle and high school students while introducing them to the exciting world of eBooks and ePublishing, the wave of the literary future. The 2013 Competition will open for entries in September, 2012. 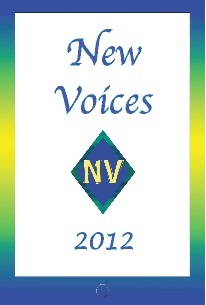 Download a New Voices Young Writers brochure to send to your school, homeschool organization or young writer. Students from around the world have entered in the past. Teachers, librarians and authors are welcome to volunteer as judges. The registration form for judges is on the website. Looking for some fun this weekend? Head out to Jackson, MS where there is going to be food, dancing, and fun! The ArtsFusion Open-Air Market will be open all day Saturday, August 25, 2012 for spectators and participants. There will be artwork, food, and music. Contributing to the menu are Flaps tamales, Lumpkin’s BBQ, Petra Cafe, and a few with the taste of the islands. Come out and fill your belly with good southern cooking! And what market would it be without some music? Rumor has it Emma Wynters will be there. With music comes dancing! Look for Salsa and African dance performances. Want something for the children? Facepainting is available, and more activities will be provided. 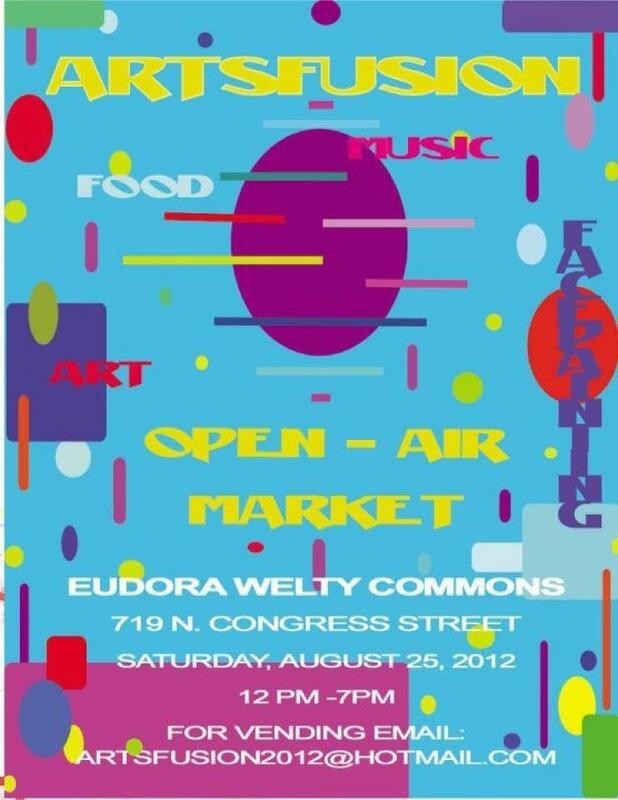 At the Eudora Welty Commons at 719 North Congress Street on Saturday August 25, 2012 from 12pm-7pm. There is an entry fee of $10. Need more incentive? How about there will be beer and wine, though it is advised to bring lawn chairs to sit.